Another week, another barrage of attacks on farming. As an industry our instinct is to respond with reason and rationality. But that is hard to do when your opponents appear to have no intention of being reasonable. Look no further than the recent ‘Dairy is Scary’ campaign for evidence of that. ‘Humane milk is a myth’ screamed the posters. What then is the evidence for this assertion? An opinion piece published in The Guardian newspaper. Back in the arable sector neonicotinoids are still making headlines, this time following European Commission proposals for a complete ban on their use in all field crops because of a risk to bees. This would, of course, affect their use in winter cereals and sugar beet, where they provide control of virus-carrying aphids, among other pests. So successful has been the use of seed treatments in sugar beet, including in recent years neonic-based formulations, that the incidence of virus yellows has declined significantly since the late 1970s. Seed treatments, used in conjunction with virus yellows risk forecasting, have helped insure growers against yield losses of 40-50%. Neonicotinoid seed treatments also help protect winter cereals against yield-robbing BYDV infections and are an important part of IPM approaches in high risk areas. The Commission’s proposals come before results of a full-scale evaluation by the European Food Standards Authority of the risks posed by neonicotinoids to bees are released. Findings were due to be published earlier this year but scientists have been given more time to assess the information they have received. But with draft proposals already drawn up, the prospect of politics not science yet again driving a decision is a cause for concern. Politics aside, the weather is also raising anxiety levels. Here in the eastern counties, as of mid-April, we could do with a decent drop of rain. Soils are drying rapidly and, with no significant rain forecast, fears are growing for recently- planted spring crops. Further west, however, soils are said to be still too cold and wet for drilling and planting in many cases. Given the unpredictability of our weather and the importance of good crop establishment it is not surprising agricultural machinery manufacturers are investing heavily in developing drills better able to cope with a range of conditions. 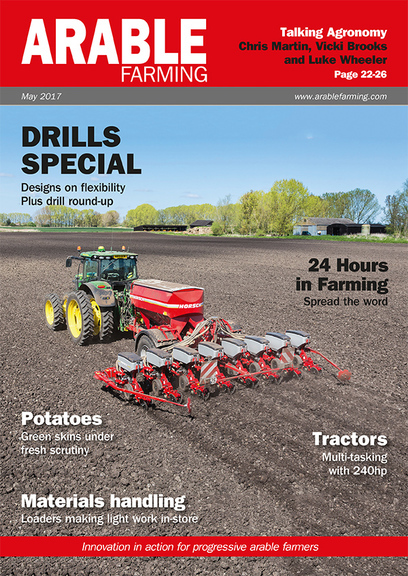 Don’t miss our feature in this issue bringing you news of the latest advances as well as a round-up of some of the machines on the market. It might just put you on a path to (almost) stress-free spring drilling.